Minnesota Pork Congress is the Midwest’s BEST swine specific tradeshow and education event that features a wide variety of tradeshow exhibitors, timely seminars and social activities designed exclusively for pig farmers and pork industry stakeholders. NOTE: Minnesota Pork Congress does not work with a 3rd party to secure hotel reservations and does not sell exhibitor or attendee lists. 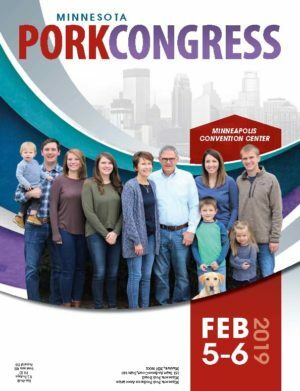 Hotel reservation information will be made available closer to the 2019 Pork Congress Event. Reserve Hotel Rooms April 2019. Tuesday, Jan 28, 9 a.m. – 5 p.m.
Wednesday, Jan. 29, 9 a.m. – 1:30 p.m. Schedule of Seminars and Events TBA. Pork Congress is a swine-specific tradeshow and education event that features a variety of tradeshow exhibitors, timely seminars and social activites designed exclusively for pig farmers and pork industry stakeholders.